The Jacob Blauvelt House is owned and operated by the Historical Society of Rockland County, a nonprofit educational institution and principal repository for documents and artifacts relating to the history of Rockland County. Jacob Blauvelt’s ancestors came to the New World from Holland in the early 1600s. In 1741, Jacob’s great-grandfather bought the land in New City on which the Historical Society of Rockland County's facilities now stand and passed it down from father to sons for generations. When Jacob built this house in 1832, it sat on about 100 acres of farmland. The property also contained a barn, a carriage house, sheds for tools and animals, a woodlot, an orchard garden, an herb garden, and a vegetable garden. Jacob and his wife, Margaret, had been married for about sixteen years and had five children when they built the traditional Dutch-style home. The Blauvelts were a middle-class farm family, and their 1830s home is bigger, and somewhat fancier, than homes built in the Colonial period (1620s–1770s). The Blauvelts were able to produce more milk, butter, eggs, rye, and corn than they needed, so they sold the surplus for profit. The additional money allowed them to buy some of the well-made furniture and small luxuries present in the house. Descendants of the Blauvelts lived in the home from 1832 until 1970, when the family sold it to the Historical Society of Rockland County. Some of the furniture is original to the house; the rest is from the Lower Hudson Valley region. 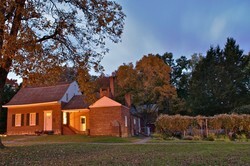 Since February 1, 2010, the Blauvelt House has been open for guided tours by appointment only. To schedule an appointment, call the History Center Manager at (845) 634-9629 or email info@rocklandhistory.org.